Lake Havasu, Arizona has been a favorite place to go for my husband and I since we were teenagers. You can go boating, water skiing, and fishing. We use to water skis, but now the body just handle water skiing any more, so boating is what we do now. Today our kids and grand-kids join us boating, wake boarding and tubing( my granddaughters favorite) where they sit on an inflatable tube tied to the back of the boat. In rough water you bounce around and have fun. This Memorial Day our daughter and her family came out join us at the lake. This weekend we experienced very unusual weather. Normally the weather this time of year is in the high 90’s and low 100’s. Alan and I arrived Thursday evening and the temperature was in the low 70’s. We thought we would get a jump on the crowd. We launch our boat on the lake , find a cove on Friday and spend the three days going in and out of a cove. We woke up Friday with the wind blowing 20-25 mph! the lake was so rough their were white caps. We decided not to go on the lake. We changed our plans and decided we would not get a cove, we would hang out in the boat during the day.The weather forecast was for a cooling trend. Friday night our daughter and her family arrived. We woke up on Saturday to 68 degrees! That’s winter temps for Lake Havasu. The high was 80 degrees with 10 mph wind. We did not bring sweatshirts so we decided not to go on the lake that day. So we changed our plans. My granddaughters and I went to the Aquatic Center. An indoor water park, we swam in pool and had fun being together anyway. Sunday we woke up it was in the 70’s and no wind. We packed a lunch and launched our boat on the lake. We had so much fun riding in the boat and getting into the water. The water was a bit cool, but we got in anyway. We were thankful we could spend time together this Memorial weekend. I hope you had as much fun as I did! 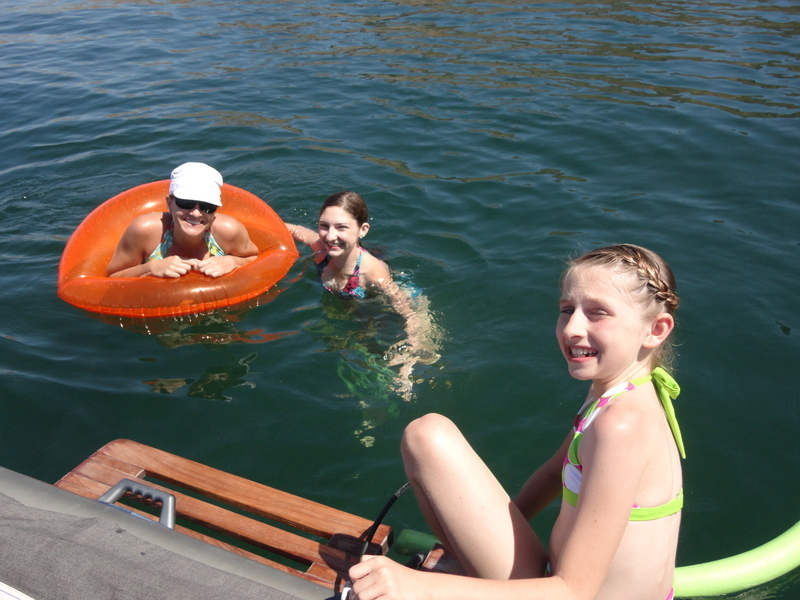 This entry was posted in children, families, family, Uncategorized and tagged boating, grandchildren, Lake Havasu, Memorial weekend on June 2, 2012 by Debbie Nichols. My granddaughter, Bailey will be celebrating her 11th birthday very soon. She asked me if I could come to her birthday party, my answer was.. ” Of course I will be there!” I asked her what will we be doing for your birthday? She said “I am having a rollerskating party. I have invited a some friends”. I tld her” I know how to roller skate”. I then shared with her how her mom(her great grandmother) when her mother was a little girl, our entire family went rollerskating at a roller rink every Sunday. My dad( her great grandfather) and his brother( my uncle Leo) roller skated when they were young. My Uncle Leo was a floor guard at a roller rink and he took his brother( my dad) to the roller rink every weekend. Needless to say the two of them were incredible roller skaters. My dad could dance on roller skates with my mom, skating in any direction they wanted to. As a kid I loved it. As an adult my dad would skate with me, it was so much fun…Today my uncle has passed away. My dad is in his late 70″s and is fearful of falling and breaking something, which I understand. My granddaughter listed to my story with great interest. My granddaughter told me I could go skating with her if I wear neon clothing, because that is what all of her friends were going to wear. Well I should have saved those 80’s outfits! Wish me luck in finding something to wear and hopefully I won’t fall! This entry was posted in children, families, Uncategorized and tagged birthday party, family, family traditions, grandchildren on April 30, 2012 by Debbie Nichols. This year my husband Alan and I were able to spend Christmas with our grandchildren. While driving to their home which takes us about 5 1/2 hours, my grandddaughter Ivie ( eldest) texted me on my phone.She asked me when would we arrive at her home. I know our daughter, son in law, and our granddaughters were excited we were coming to spend Christams with them. Alan and I were just as excited. We always have a fun time together. Traveling in car brought back many memories of when I was a child, and my grandparents lived far away. My grandparentss would come for Thanksgiving and would stay until New Year day. The holidays were so exciting having them spend time with me. My grandmother made a large variety of cookies. And when we became adult, she would give us our own box of selected candy and cookies along with canned cherries, peaches, applesauce and salmon. My grandparents lived near fruit orchards and they loved fishing. They did all their own canning. We all looked forward to our own Christmas goody box. I did continue the tradition on a smaller scale, by making 4 different kinds of cookies, pumpkin bread with orange frosting and 1 candy. 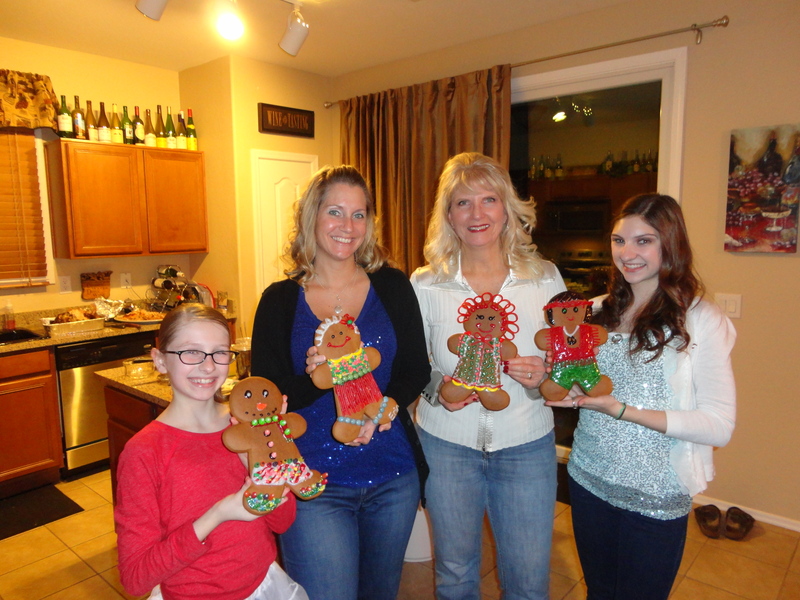 When we arrived my granddaughters were so excited to see all the goodies I had made. While shopping a few weeks prior at Trader Joe’s (a specialty market) a large precooked gingerbread man. I thought it would be fun to decorate this cookie. I bought 4 cookies for us girls to decorate, I figured my husband and son in law would not mind not participating in this activity. I purchased all types of shapes of candy to decorate. My granddaughter Bailey and I sat down and drew out a designs on paper of what we wanted our cookie to look like and coming up with different ideas. My granddaughters were so excited. On Christmas day we decorated our gingerbread man. 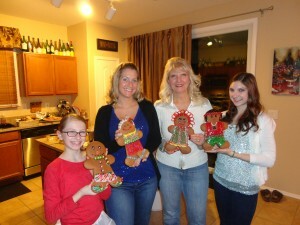 I made my gingerbread a Girl, Erin’s was a Hawaiian girl, Bailey’s was a colorful Snowman, and Ivie’s was a Hippy! It was fun creating a new tradition together. Did you create a new tradition? This entry was posted in children, family, Uncategorized and tagged family, grandchildren, holidays, tradition on December 28, 2011 by Debbie Nichols.